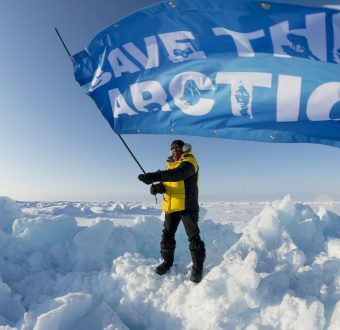 “This is a victory for everyone who has stood up for the Arctic. Whether they took to kayaks or canoes, rappelled from bridges, or spread the news in their own communities, millions of people around the world have taken action against Arctic drilling. Today they have made history. “Today, President Obama can also make history by cancelling any future drilling and declaring the US Arctic Ocean off limits to oil companies. There is no better time to keep fossil fuels like Arctic oil in the ground, bringing us one step closer to an energy revolution and sustainable future. “While this is a victory for everyone who hoped to avoid a catastrophic spill–or catastrophic climate change–from Shell’s plans, it’s also proof positive that drilling in the Arctic is too costly to be effective and a bad bet for other energy companies. It’s time to start making the shift to renewable energy instead of pursuing extreme fossil fuels. 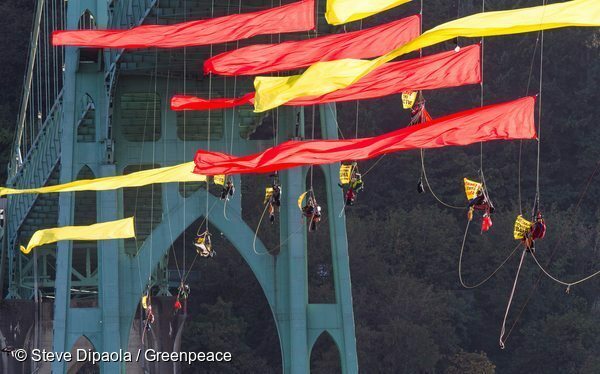 Colorful streamers float on the wind under the St. Johns Bridge where climbers and kayaktivists attempt to prevent the Shell-leased icebreaker MSV Fennica from joining Shell’s Arctic oil drilling fleet. The Fennica came to Portland to have a gash in its hull repaired after being damaged in the Arctic as Shell prepared to explore for oil in the Chukchi Sea.